By land or by air, the avalanche dominates from anyplace that one looks at it, and on top of it protrude the tire of a small truck, a vehicle leveled, a stove, the roof of a house, a shoe’s heel, a garage, rocks, sand and branches. The 20 topos (moles) that have carried out recue work since September 22 seem insufficient for removing the “treacherous” mud that descended with force, as if spit from the hill, last September 16, which they have not been able to remove, except at a few sites counted on the fingers of one hand. The survivors calculate that there are some 90 cadavers under the mud, because it was a holiday when they were buried. 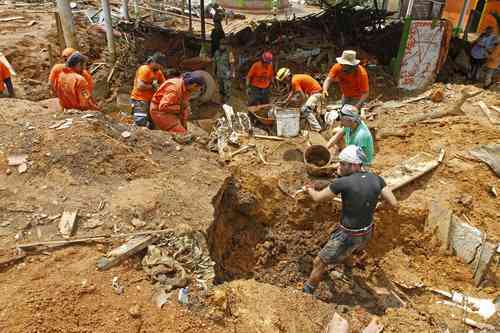 He calculated that in the two Independence Day mudslides, when the majority of the town got together to eat pozole, the community was buried with a hundred thousand cubic meters of mire in an area of 400 by 400 meters and some six meters of depth. The rescuers have placed boards, doors and rocks over the muddy ground so as not to drown when walking, because “it absorbs you, you get in up to your waist and you can’t get out.” There for the excavations are suspended while it rains, which is every day, besides at night, because the risk of another mudslide exists. With the passing of the days, the mud has hardened and is more difficult to remove. “The work is artisan,” details the chief of the moles. He points out that there are still mountain villages incommunicado, like Nueva Delhi, Puerto Gallo, El Molote, Las Delicias, Arrayán, Toro Muerto, Piloncillo, El Tambor and El Iris, whose inhabitants carry food supplies and water by helicopter. A group of 10 soldiers make excavations at the other side of the town, some 50 meters from the rock engraved with hieroglyphics that give the community, founded almost 50 years ago, its name, in which some 600 people were living at the moment of the mudslide. A detachment of almost 40 members of the Army and 10 more of the Ministry of the Navy accompany the 16 inhabitants of La Pintada that have decided to stay to look for family members and to form nighttime guards, divided in two groups, to avoid the solitary homes that survived being looted, because the mud divided the village in two. All the people that arrive in La Pintada walking must be noted on a list, “for their security, there’s not going to be another mudslide and we don’t know what their name is,” explained an Army official. Landslides and washouts invade the road that joins La Pintada with El Paraíso, the community with which communication by road from Atoyac is now re-established. Groups of people that go from Atoyac and El Paraíso, with picks, shovels and pots of food, walk along the 10 kilometers of constantly ascending road. “We came to help in any way we can, we came because we had friends here,” express Francisco and Israel Bautista, volunteers from the Santa María de Guadalupe parish, in El Paraíso, who offer water to the reporter and the photographer from La Jornada, while they lead them through a shortcut on a wooded hill. The young man walks without stopping to La Pintada pulling wheelbarrows with dirt and whatever he can offer to the soldiers and rescuers dressed in orange.